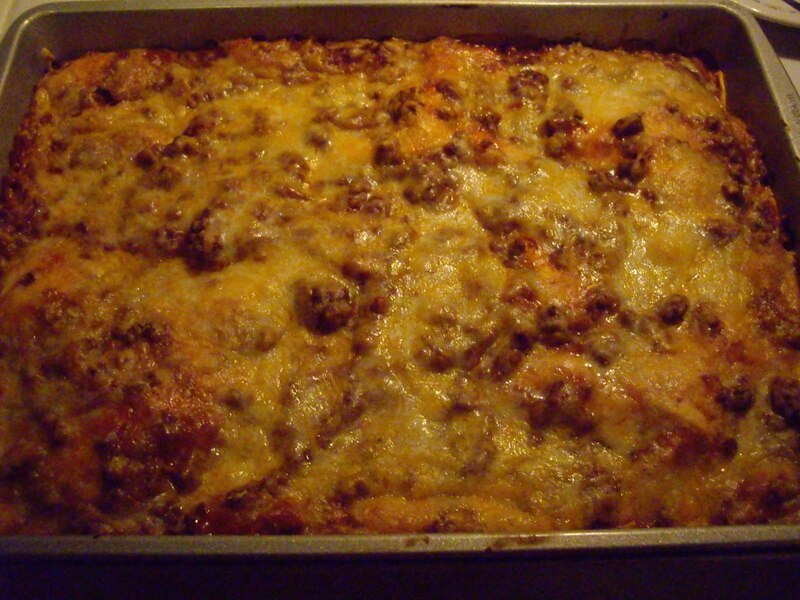 Mexican lasagna is a nice change from your traditional lasagne. It is made with flour tortillas instead of noodles. You will need a 13″x9″ baking pan. In a skillet, brown the meat. Add the taco seasoning, salsa, and tomato sauce. While that simmers mix the cottage cheese, eggs, and oregano in a bowl. Cut or tear 3 tortillas in half and line the bottom of the baking dish. Stick another whole tortilla over the middle of the pan. Spread half the meat sauce over the tortillas. Spread the cottage cheese mix over the meat. Arrange the other 4 tortillas over that mixture following the same way as the first time. Spread the rest of the meat sauce over that. Can serve up to 12 people.